Not knowing what’s going to happen when I sit down to write is a lot more fun than outlining a plot beforehand. For me, already knowing the whole story turns the writing of it into “work.” The downside, though, is that not planning sometimes results in a chaotic mess, like Zen Flowers, the book I’m writing now. It’s the fourth in a series, and I’m winding up Part One. I’m worried about whether it will end up a story or just a bunch of episodes that go nowhere. Lots of things are happening; but do they make a story? I don’t know yet, but since my characters still have such a grip on me, I decided to go ahead and finish the first draft. I can decide later whether it needs massive editing and restructuring, or whether it’s something I wrote just for my own entertainment. My characters, Niall and Celeste, have been through a lot. They’ve been together five years now, and Celeste misses the romance they once had. I want to convey how romantic they still feel toward each other underneath all the stuff that gets in the way: their work, children who demand all their attention, financial problems, and the disagreements that make each one afraid the other would be relieved if they separated. I want something different from drinking at the pub or gazing at each other across a restaurant table; they’ve done plenty of that. I decided to take them to the beach, which meant I had to go to the beach. It’s 90 miles, and it was my birthday. So, last Monday morning, I packed up my camera and drove west to Astoria, then south to Seaside, a “fisherman’s wharf” type of place with arcades and shops and saltwater taffy and a carrousel. The beach is wide and flat and has a quality of light that makes me feel like I’m dreaming, and that I knew Niall, a photographer, would appreciate. It was sunny when I left Portland; we’ve had a bout of temperatures in the 90s. It was heavily overcast and about 20 degrees cooler on the coast, with heavy, low clouds. A lot of people were on the beach in spite of the cold weather, or maybe because of it. Seaside has lots of seafood restaurants, and I headed over to Norma’s for their delicious clam chowder, packed with so many clams that I was full before I got to the bottom of the bowl, but I ate the whole thing–yum! 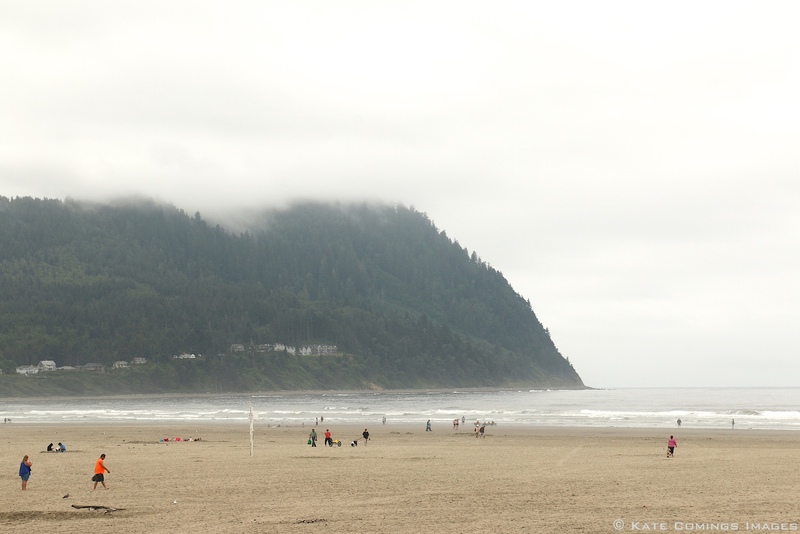 I headed south to Cannon Beach. 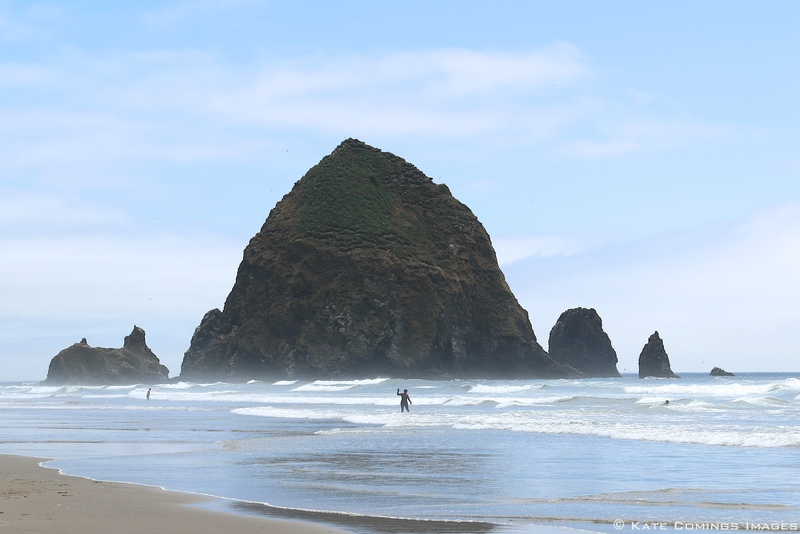 I knew Niall would want to photograph Haystack Rock, a giant, iconic boulder rising out of the surf and hosting several bird populations. The light, however, was terrible for photography. My camera has a viewfinder, so I could at least frame my shots, but the glare was so bad, I couldn’t see the light meter or any of my settings. A girl asked me to take a picture of her with her cell phone, and I could barely make her out on its screen. I was, I think, the wrong time of day. Early morning or evening would probably be better. 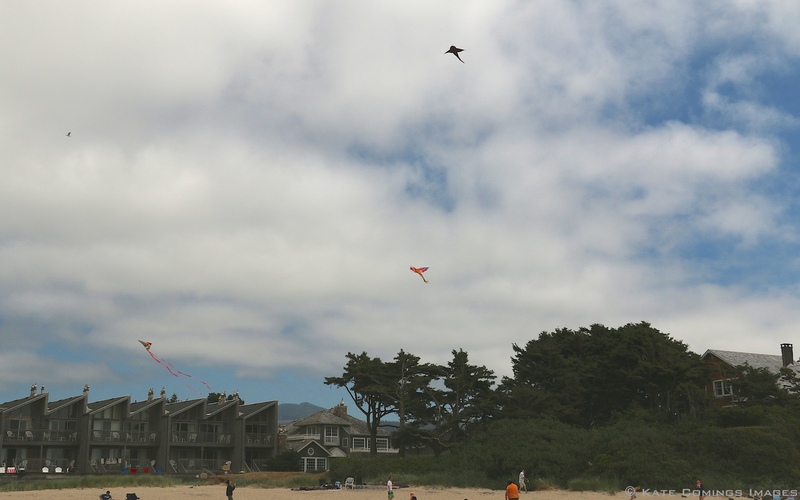 People were flying kites. A long time ago, a guy said he wanted to fly a kite with me. I thought that was soooo romantic. Nothing ever came of it, but… I had my idea! There’s nothing better than a long car drive for getting the ideas bubbling. When I drove from Portland to my old university at Santa Barbara, Calif., I planned to go over the manuscript of “Playing in the Apocalypse” at the place where it happened, but so many ideas for a new book downloaded into my head on the way that I couldn’t wait to start writing “Hostages” (working title). I wandered around Isla Vista and took lots of photos, but half my attention was on my new book. Funny how that works. 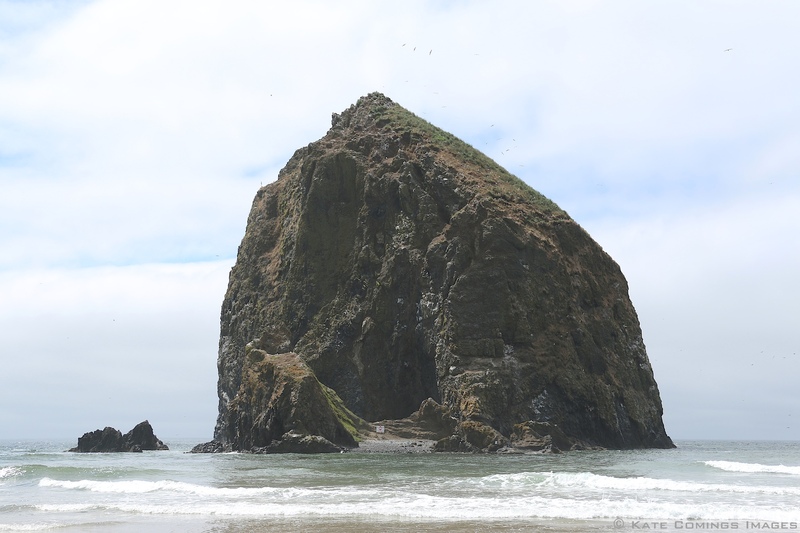 Tags: Beaches, Cannon Beach, Haystack Rock, Ideas, Isla Vista, Kites, Oregon Coast, photography, Seaside, Writing | Permalink.